Even though I haven't posted any new thoughts in this section since the regular season ended, and my weekly columns on ESPN Insider and NHL.com are on hiatus for the summer, that doesn't mean that I've been idle. I've updated all the data in the downloads section, I've been hard at work on the Hockey Abstract 2018 Update, my weekly radio spot on TSN 1290 is still on-going, and I'll be participating in the NHL's 31-in-31 feature series in August again this year. 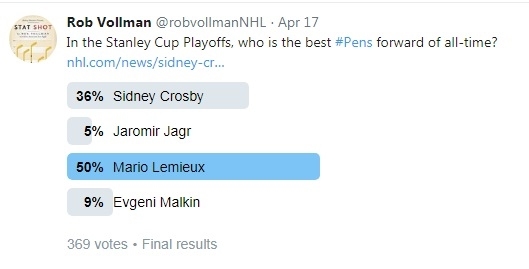 I've also continued to comment on the scoring race, the playoffs, the NHL awards, the draft, and free agency on social media, and run the occasional opinion poll. In fact, I thought I'd share some of the more interesting things right here, right now. 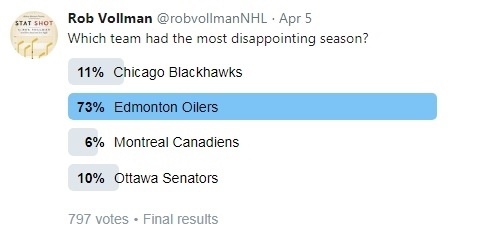 Quite a few teams had a tough season, but it seems like the overwhelming feeling is that Edmonton's season was the most disappointing. Forget the Art Ross Trophy, because here are the results of the All-Connor scoring race. It's another one for McDavid! In other news, with a career-high 92 points, Anze Kopitar has led all Slovenians in scoring for the 12th consecutive season. Jan Mursak gave him a bit of a scare in 2011-12, I think. On an only slightly more serious note, I did a first-name scoring race, as requested by Rob Denaburg (@rsd08). This does not include goalies, nor does it group variations of names together. If you do group names, I think Alex wins with 778, well ahead of John, 621. By first name, the lowest scoring rate is Ben (minimum 200 games), with 29 points in 214 games, which is 0.14 points per game. Bobrovsky (65 starts), and Hellebuyck (64) were each replaced once. As mentioned by Sportsnet Stats (@SNStats), this is the first time in NHL history that both Detroit and Montreal missed the playoffs in the same season. The Red Wings made their debut back in 1926-27, and Montreal is one of the founding teams. As Jason Paul (@WaveIntel) observed, there was a big gap between the top, playoff-bound teams, and everybody else this year. Winnipeg (and Vegas) ended their playoff series victory drought. The longest drought is Florida, who advanced to the second round only once, in 1995-96, before any of these three franchises even existed. Columbus has never won a playoff series, but they made their debut in 2000-01. They were actually up 2-0 on the Capitals in the first round this year. Pittsburgh was finally knocked off by the Capitals. 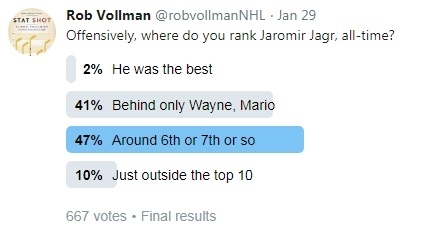 Looks like fans still think Mario was number one. So it was Vegas and Washington in the Stanley Cup Final. 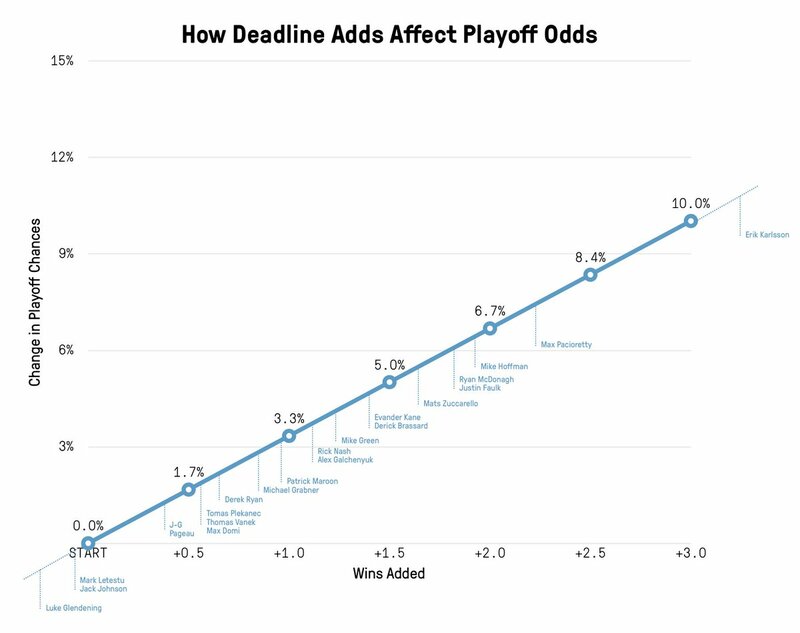 Based on Dom Luszczyszyn's (@dom luszczyszyn) research, seeding doesn't matter quite as much as it used to, in terms of who wins the Cup, or makes the Final. Many felt the Fleury deserved the lion's share of the credit for Vegas making the Stanley Cup Final. Few predicted his collapse. And of course Washington won. Canada was shut out again. The odds were 472-to-1 that no Canadian team has won the Stanley Cup in the last 25 years. Of course, the odds of winning seven straight in the 1980s: 1-in-2187. Since the original 1967 expansion from six teams, you would expect Canadian teams to have won the Stanley Cup 12.2 times. They have won it 16 times. With a combined 188 shots in the playoffs, Kuznetsov and Ovechkin fell just shy of the two-player record, held by Zetterberg and Samuelsson, who took 195 shots for Detroit in the 2007-08 playoffs. Thanks to player usage charts, I noticed Anze Kopitar's possible inclusion among the three finalists for the Hart pretty early. Of the 10 players that scored 90 points (or close to it, Kopitar is known for taking on top opponents (vertical axis) in both zones (horizontal axis), has good shot-based metrics (in blue), and is the only regular on the PK (not on chart). The Vezina is always frustrating, because it seems to be based on wins rather than the goalie's own performance. 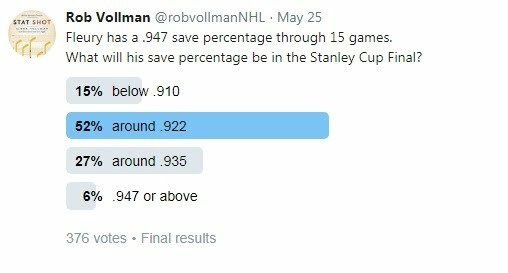 Well, at least the goalie who actually was top three in all four regards was the goalie who won, Pekka Rinne. Doughty won the Norris. My friends at @Fantasy_Ref were kind enough to point out that my pre-season points projections for last year's Norris finalists were all within 2 points. Burns and Karlsson were within 1. 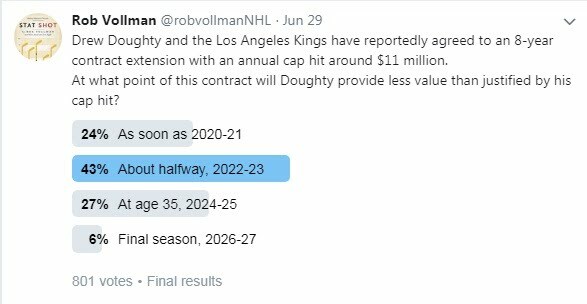 That led to a big contract for Doughty. If you're unhappy with any of the PHWA's voting results, Jack Flancer (@jakef1873) put together a visualization of everybody's voting record. Colin Cudmore (@CudmoreColin) put together a list of how much cap space each team has in terms of retained salary, buyouts, and what not. As usual, I put together player usage charts of the prominent free agents. Goalies weren't a major story this year, but it looked like Bernier and Hutton battled for top spot. Among fans, the free agents most likely to get the riskiest contract in terms of term and/or cap hit included John Carlson, Jack Johnson, James van Riemsdyk, James Neal, Paul Stastny, Ilya Kovalchuk, and Tyler Bozak. They may have been right in Carlson's case (but only time will tell). As for Kovalchuk, from 2010-11 to 2012-13 Kovalchuk played 195 games and had 79 goals, 95 assists, 174 points. Vanek, who is roughly the same age, played 196 games, and had 78 goals, 97 assists, 175 points. Vanek scored 56 pts last year, on a 1-yr, $2.0M contract, this year he signed for one year, $3.0M with Detroit. Kovalchuk's cap hit is reportedly $6.25M/yr for 3 years. I think it's safe to classify that as a massive vote of confidence. And then there's James Neal in Calgary. Neal turns 31 in September, has 48 goals, 37 assists, 85 points in 141 games over the past 2 years. In 2010-11, the Flames had Niklas Hagman, who turned 31 in December, and had a 47 goals, 39 assists, 86 points in 147 games over the previous 2 years. I know these are two very different players, but it is interesting to note that Hagman scored 27 points, then 23 points, then retired. Before getting too tough on Carlson, Kovalchuk, or Neal, it's also important to remember the contracts that we thought would be regrettable but turned out to be a fair value. Those on Twitter pointed to Tyler Bozak as a leading example, but there's also Chara, Dillon, Klingberg, Ekholm, Gonchar, Subban on the blue line, Ovi, Giroux, Kessel, Kadri, Smith, Hossa, Ward, Staal, Sedins up front, and Luongo and Rinne in goal. I updated all the contracts in my cap management model from the first chapter of Stat Shot and made this chart. And, for those who remain despondent about their favourite team's location on this chart, remember that nobody is in worse shape than Toronto was three years ago. With a lot of effort and a little luck, cap situations can be repaired quicker than you think. William Karlsson had 43 goals on 184 shots this year. Based on previous career average of 7.7%, he would have scored 14.2. That difference of +28.8 is the greatest of the post-1967 expansion era, edging out Lanny McDonald's +28.3 in 1982-83. The closest recent comparable is Brad Boyes, +19.9 in 2007-08, and Joe Pavelski, +18.4 in 2013-14. We almost went the entire season without a coach getting fired. 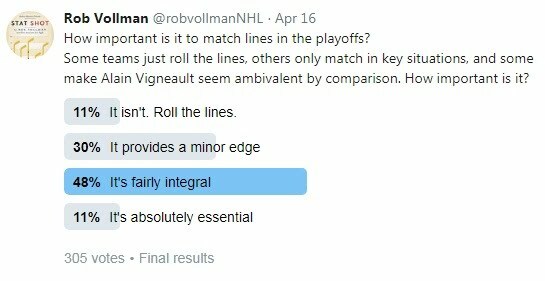 Actually, since the Rangers already played their last game when Vigneault was released, perhaps we did, on a technicality. To replace Peters, the Hurricanes are boldly going with Brind'Amour as coach, the 8th since 2005 without head coach experience at any level. It will be an uphill battle. Should the salary cap be based on post-tax dollars? Here's a glimpse into what that would look like. Micah Blake McCurdy (@IneffectiveMath) examined the 2018-19 schedule looking for which team it favours. For those of you who have been enjoying the DEV model, the numbers have been updated with 2017-18 data. Emmanuel Perry of Corsica Hockey has a version of NHLe that's done differently, and has a far greater number of leagues. The fourth annual hockey analytics conference at Carleton University is being held September 14-15. Register here. Luke and Josh of Evolving Wild put together their version of WAR. I think we're up to a dozen stats of this nature, five of which are called WAR. Thanks to Matt Barlowe (@matt_barlowe), you can scrape the NHL's central scouting reports. Go to his Github page to get the code. Who are this year's greatest overachievers? As one way of answering that, I compared everyone's points (as of March 15) to their three-year average points per game multiplied by the number of games they have played. I found that William Karlsson, Nathan MacKinnon, and Mikko Rantanen were on top, and ahead of the pack. Karlsson is such an interesting case. At the time, he had 39 goals in 164 shots (23.8%), after a previous NHL total of 18 goals in 233 shots (7.7%) and AHL total of 10 goals in 127 shots (7.9%). I'm not sure I've ever seen this dramatic a transformation, except for the cases where a player was suddenly moved from a depth line to Mario Lemieux's wing. I also found four other players for Vegas on that list, the only team to appear more than twice. I expanded the search, and counted up all the players who had scored at least 10 more points than expected, and Vegas has eight. Boston was next with six, then Minnesota, Philadelphia, and Washington had five, and Anaheim, Nashville, and Tampa Bay had four. Karlsson got a lot of extra ice time, which would explain his extra scoring. I repeated my calculations, but looked at ice time instead of points. Karlsson ranked sixth overall, and third among forwards, and was one of four Golden Knights on the list. There are some really interesting names on that list, like Josh Anderson of Columbus. Despite an increase from 12:01 per game to 18:14, he has the exact same total of 29 points. Colton Sissons went from 11:07 to 16:05, and he went up to just 27 points. 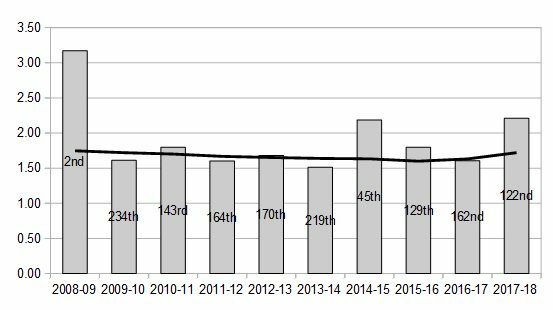 That's a jump from 10 points in 2016-17, but it's still not much. Extra ice time doesn't necessarily mean more points, especially if it's spent killing penalties or playing in the defensive zone. There's no question that Vegas is the most surprising team this season, but I asked my Twitter followers who was next, and it sounds like it's Colorado, despite that top line being the only one to really defy expectations. I also took a look at the rookies, and it stands out that Yanni Gourde has 61 points in 80 games, which is 0.76 points per game. In the AHL, he had was 0.66. We were only expecting about 25 points per game, especially since he's only 5-foot-9. He's like another Jonathan Marchessault. Looking at all other players who came up from the AHL last season, other big out-performers are Heinen, Debrusk, Kempe, Connor, Gibbons, and Bjorkstrand, all up by around 11-17 points apiece. On defense, Charlie McAvoy is the one out-performing expectations. He had 32 points in 60 games before getting hurt, but we were only expecting about 20, based on his Hockey-East scoring. Clayton Keller, on the other hand, is right on with expectations, as is just about everybody else who came from that conference. The other interesting situation is how McAvoy was able to effectively play in a top-four role right away. With only a few exceptions, the numbers confirm that most new NHL defensemen are sheltered, in the offensive zone and against bottom-six competition. If they are used in more ambitious roles, like Santini, they usually get crushed. McAvoy is really one of those really rare cases. What does this mean for the Calder race? 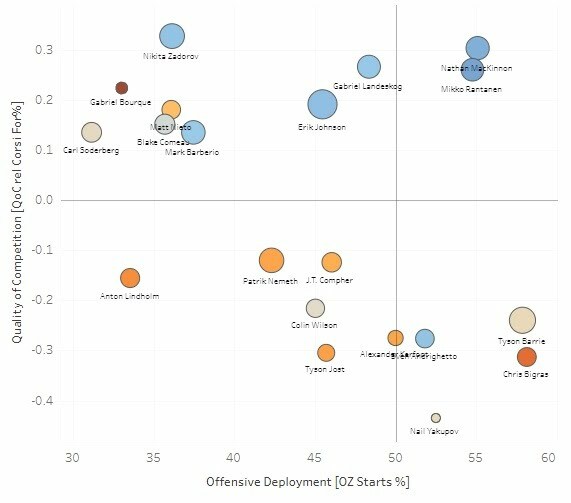 Well, let's remove the defensemen who aren't rookies from the chart above, and add in the forwards. Remember, blue circles indicate good shot-based metrics, and big circles a lot of ice time. Tough minutes is towards the top left, more sheltered minutes to the bottom right. You can play with these charts yourself using the tool on my website. You can see Gourde didn't get a free pass this year, and McAvoy looked like a great choice until he got hurt. However, Barzal will probably win. He's the one with the dark blue circle right in the middle of the chart. Can't complain too much about that choice, because only Dubois had comparably strong shot-based metrics, and he was used mostly in the offensive zone. Getting back to the blue line, I made a player usage chart with each team's No. 1 defensemen. The archetype is some combination of Giordano, Letang, Josi, Doughty, Provorov, Suter, Ekman-Larsson, and Pietrangelo. It's not always clear who is each team's No. 1, but hopefully I'm close enough. I included McDonagh for NYR, even though he's in TB now. What does this mean for the Norris race? Well, it does appear that Morgan Rielly deserves some consideration. I mean, I wouldn't have him at the top of the list, but I'd certainly take a closer look. Since scoring is so important to voters, here's a player usage chart of every defensemen with 50 points (or within striking distance). Remember that blue circles indicate good shot-based metrics, big circles indicate lots of ice time, and tough minutes are top-left. With the injury to Suter, I really think Doughty is the clear front-runner, but we'll see. Whether Doughty wins the Norris or not, I was curious if he was viewed as the team's most valuable player. I certainly think he is. 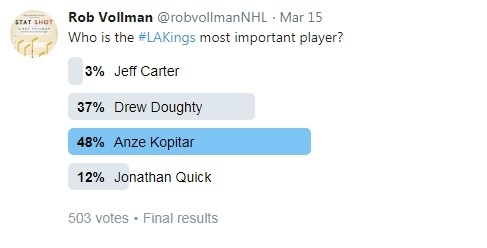 However, most fans gave the edge to Kopitar instead. It's not that hard to see Kopitar's appeal. Among the NHL's top scorers, Giroux and Kopitar stand out by playing tough minutes against top competition (vertical axis), and in the defensive zone (horizontal axis), and still have good shot-based metrics (blue). That gives each of them a pretty solid case for the Hart trophy, since there's an unwritten rule that forbids you from giving it to a player whose team missed the playoffs. I asked everyone what they thought about that unwritten rule, by the way. Surprisingly, no one saw it as something that should rule a player out completely. That will probably comes as big news to Pavel Bure and Jarome Iginla, whose failure to win the Hart Trophy in separate seasons 15 years ago can't otherwise be explained. It sounds like missing the playoffs is a factor, but only a minor one. If that's true, then McDavid has a real shot to win it this year. In addition to those who exceeded expectations, I also looked for players who missed expectations, and there's a clear winner in that category: Jason Spezza of the Dallas Stars. He scored just 26 points in 76 games. His previous career low was 50, if you set aside the five games he played in 2012-13, and his 21-point, 33-game rookie season. Is this it for him? In something of a vicious circle, most of the players who dropped in scoring also dropped in ice time. One of the exceptions is Brandon Dubinsky, who dropped from 17:54 to 15:25 in ice time, but plummeted in points from 41 to 15. I usually don't see drops like that unless a player is injured, or he finds out I picked him in my fantasy pool. In case you're wondering, there is one team who had more players drop by at least 10 points than Columbus, and that's Chicago, with five. Buffalo, Calgary, Pittsburgh, and Vancouver were at three apiece. Chicago is also interesting is that they're one of the exceptions to the generally close relationship between how often a team faces off in the offensive zone, and their share of shot attempts. I mean, if you start shifts in the offensive zone, then you get more shot attempts. And, if you get more shot attempts, more of them are frozen in the offensive zone, getting you more faceoffs there, right? Maybe one of the more interesting exceptions are the Rangers, who usually start in the offensive zone, but have the worst shot attempt percentage in the league. On the other pole there are teams like Dallas, who have great shot-based metrics, but always seem to start shifts in the defensive zone for some reason. Perhaps this is how we can identify teams that might be "gaming Corsi"? Well, we're basically already into the odds and ends section, so let's start with @CodexRex, who completed a great study of officiating, and found that roughly 1 in every 6 infractions are penalized (among other interesting findings). Does that sound right to you? I guess it does. With 6 points in his last 5 games, Marleau has reached the 40-point mark for the 18th time in 20 seasons -- exceptions were his rookie season and the 48-game 2012-13. I don't want to jinx it, but another remarkable situation is that no coach has been fired in 2017-18. In two days, Jon Cooper will have been coach of TB for five years, which is the second-longest single-team tenure among active coaches. Gabriel Landeskog is +30 at home, but -11 on the road, largest gap in the league. Malkin and Staal are now 2 of 7 active players 3 40-goal seasons. Ovechking (9), Stamkos (4), Gaborik, Hossa, Nash are the others. With the addition of Wheeler and Voracek, there are now 14 active players who have recorded 60 assists in a season. With Giroux and McDavid, there are now six who have done so more than once. Tavares has been on the ice for 108 opposing goals. No other forward over 90, and the most by a forward since Martin St. Louis in 2007-08, 113. Here's the list, since 2000. As you can see from some of the names on this list, this isn't exactly insulting to Tavares. And I'll close by mentioning that the Philadelphia Flyers are looking for a hockey analytics intern. And, that you should contact Philip Giannini at philip@statstrack.ca or call (647) 505 3430 for more details about StatsTrack's new studying at your own pace course. What if the last change didn't go to the home team, but was awarded in some other fashion? For instance, if it was based on the score, or the zone, or the manpower situation? I wonder how much of the home ice advantage would disappear? I may look into that. If you're aware of research in this matter, please be sure to send it my way. One of the hottest teams in the league right now are the Boston Bruins. They have an amazing top line, a hot goalie, and their organizational strength has finally manifested itself, and solved their long-standing depth problem. On February 9th, I noticed they had amassed 58 of a possible 70 points in the preceding 35 games, during which time they were 27-4-4, and outscoring opponents 124-68. 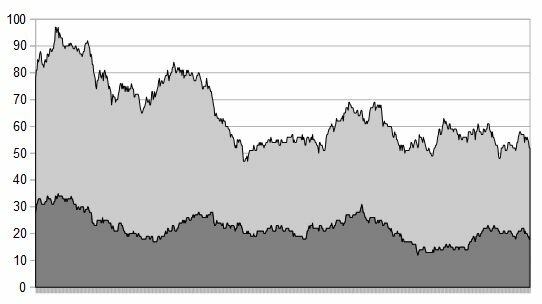 To visually demonstrate that peak, I mapped out a rolling 35-game average all the way back to the 2005 lockout, and here's how it looked. They actually got 59 points in a 35-game stretch ending in January 2009. That was the season that everything fell into place for the Bruins. Just like today's Golden Knights, everybody had a career season. Chuck Kobasew scored 21 goals in 68 games. The rest of his career, he scored 32 goals in 240 games. Mark Stuart scored 17 points, which still stands as his career high. 34-year-old Tim Thomas improved from .921 to a league-leading .933, and won the Vezina. That really puts Boston's current performance into perspective. Everything is falling into place for Boston. Mainstream opinion is this makes them a legitimate Stanley Cup contender, something that certainly wasn't the case a few short months ago. Quick note on the flip side: Columbus has made an about face in the wrong direction. On December 1, they were tied for third overall with a record of 17-8-1. Between then and February 10, they were 10-15-3, third last in the NHL. A very puzzling slide. In the salary cap era, there have always been a set of ever-changing market inefficiencies. Right now, there is a noticeable premium placed on mediocre No. 4 defensemen. We first saw this in the summer, with free agents like Karl Alzner ($4.625M/yr for 5 years), Dmitry Kulikov ($4.13M for 3), Kris Russell ($4.0M for 4), Justin Schultz ($5.5M for 3), Michael Stone ($3.5M for 3), and Brendan Smith ($4.35M for 4). Recently, Smith was placed on waivers, so it appeared that this inefficiency was slowly being corrected. But then, the Canucks signed Erik Gudbranson for $4.0M/yr for 3 years. So, the trend may continue into this summer. Granted, it's only an opinion that these are mediocre No. 4 defensemen, especially the first adjective. 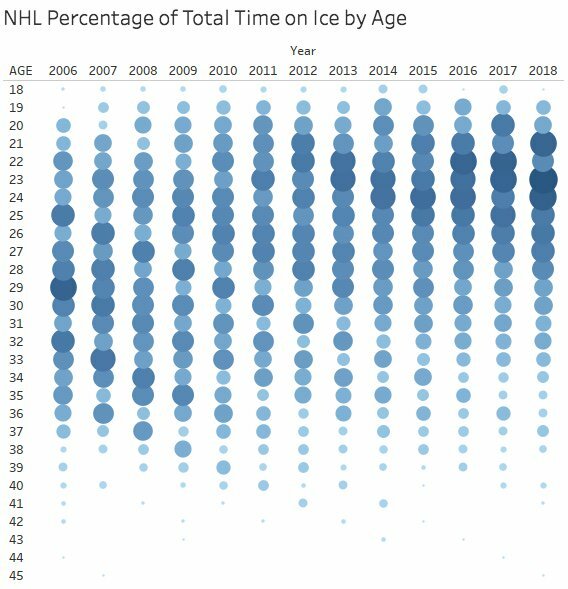 Based on their ice time and usage, most of them can be roughly classified as No. 4 defensemen as a matter of fact, but classifying them as mediocre is simply my interpretation of their underlying statistics. It wouldn't surprise me in the least if I was in error in one of these cases. Indeed, I received a surprisingly emotional and passionate defense of Kulikov on Twitter. However, most people agree with the overall sentiment, even if they disagreed with one particular inclusion. 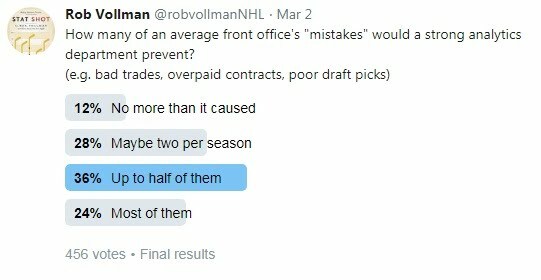 What does this mean for NHL front offices? Well, it's a bad time to sign these types of players. If a team is looking to sign a defensemen, then they might better off trying to manage with a low-cost secondary option like Nick Holden, John Moore, or Mark Barberio, and investing the savings elsewhere in the lineup. Another market inefficiency was highlighted in the recent trade between the Los Angeles Kings and the Ottawa Senators which included Dion Phaneuf and Marian Gaborik. The former got an inflated contract because of PDO, and the latter because of playoff success. Phaneuf signed his contract right at the end of the miraculous 2013 calendar year. Remember that period of time? Toronto was getting very badly outplayed every night, but won games because of high shooting and save percentages (which, when added together, form PDO). 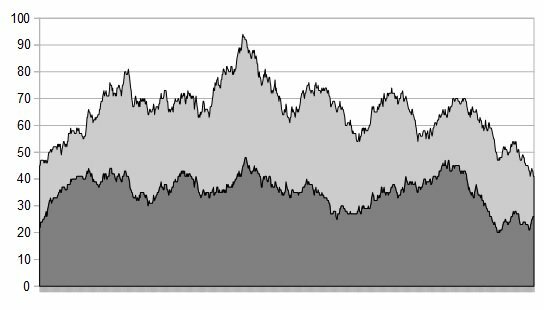 There's nothing wrong with a high PDO, but history has shown time and time again that it can't be sustained. But, in the excitement of that success, they paid Phaneuf (and others) far, far more than they otherwise would have. If anything contributes to big contracts more than a run of high PDO, then it's playoff success. Gaborik is a good example of that, because he was simply amazing when the Kings acquired him at the 2014 deadline. They won the Cup that year, so they signed an injury-prone 32-year-old to a big, seven-year deal. 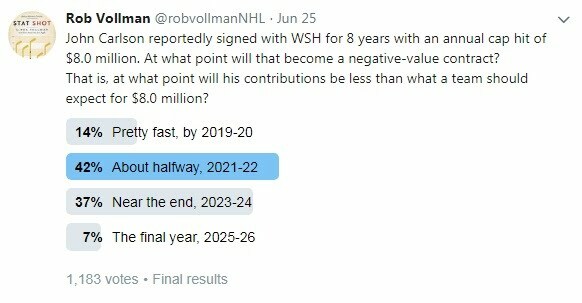 Now, only a few years into the deal, Gaborik is actually considered to be a negative asset in the salary cap world, to the point where the average fan feels that Ottawa would have to throw in a 2nd-round pick in order for another organization to take his contract off their hands. Now, I don't mean to be glib about this. They're both fine hockey players, and teams to have to make calculated gambles to win it all. Every team that has won the Cup did so by risking big investments in certain players. At the time, Phaneuf and Gaborik were viewed as those types of players. All I'm saying is that this is a market inefficiency. Those with high PDOs or who just came off playoff success generally get far larger contracts that identical players who haven't. Just to take this to a more extreme example, consider Bobby Ryan's contract with Ottawa. 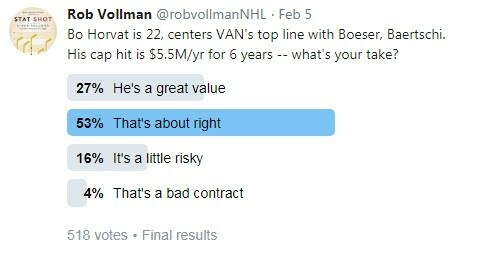 As great as Erik Karlsson is, over a third of fans think that bundling Karlsson with Ryan's contract would actually negate his trade value. Of course, I have no explanation for Ryan's big contract, because he was signed right before the 2014-15 season, and for no particular reason - no playoff success, no PDO, no awards. I'm not quite sure how that contract came to pass. This poll is still open, if you want to weigh in. Are you following your local GoalBot on Twitter? The GoalBots for all 31 teams have been setup, and you can check the Moneypuck website for more information. My ESPN article this week looked at how to repair the Detroit Red Wings, but on Twitter I asked a quick question about the Chicago Blackhawks, and if it made sense to trade one of their three core players and, if so, who? 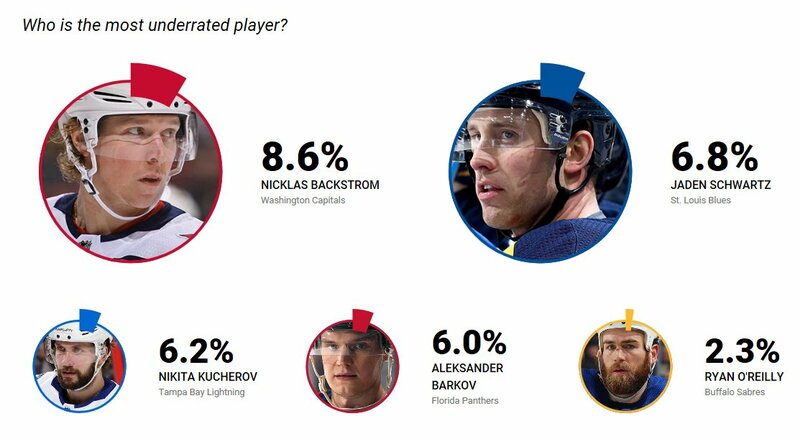 Mostly it was a split between Toews and Keith, but I'm really not sure what my opinion would be. My friend Stan Nieradka (@smn013) recently pointed out that 14 (of 37) Avalanche players from last season aren't in the NHL this year. I once dabbled with the idea of evaluating teams based on how many of their players no longer played in the NHL after that season. I'd love to go back and run this test historically and see how close 14 is to the record. It's a little surprising, but Florida's Bob Boughner is actually faring the best of this year's four NHL rookies coaches. There's buzz that Brassard could be moved at the trade deadline, but I think his value is being overestimated. Brassard is used almost exclusively for his scoring, and his scoring rate is roughly average. At 30, he may decline. 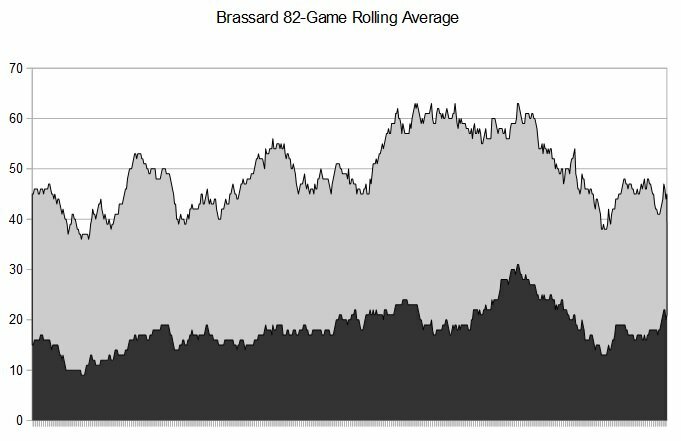 As a Senator, Brassard has averaged 1.50 points per 60 minutes at 5-on-5. That ranks 201st among the 434 forwards to play at least 500 minutes in that time, according to the data at Corsica Hockey. A few goalies have already moved, including Petr Mrazek and Darcy Kuemper. I like to look at rolling averages, so I can get a view of a goalie's upside, downside, and overall trend. 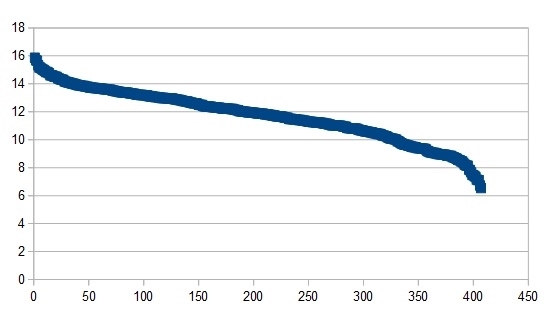 In Mrazek's case, his peak was almost exactly two years ago, from which his numbers fell quickly. Now, he is gradually climbing back to league average (in orange), but is still slightly below. As for Kuemper, he's playing at his peak, which he first hit early in his career. However, he has spent most of his career near the league average (in orange), with slumps in the 2015 calendar year, and last season. 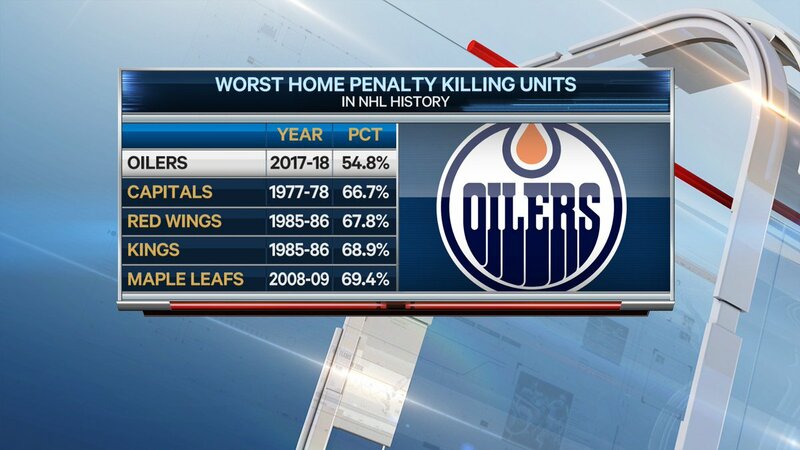 As pointed out on Sportsnet, Edmonton could be on the verge of a historically bad season killing penalties. I'm hiring a graphic artist for the Hockey Abstract 2018 Update. To apply, email vollman at hockey abstract dot com by February 15 with the subject Graphic Artist, and please be sure to provide a sample of your work. 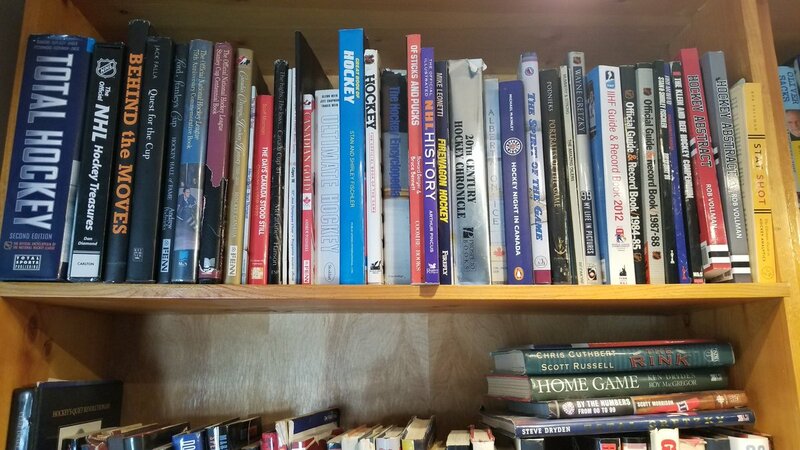 Like the 2015 and 2016 editions, the Hockey Abstract 2018 Update will be in PDF format only (not in print), will be about 100 pages, and will feature updates to the stats and innovations covered in the various books in the Hockey Abstract series. It will also feature player usage charts and analysis for all 31 teams. 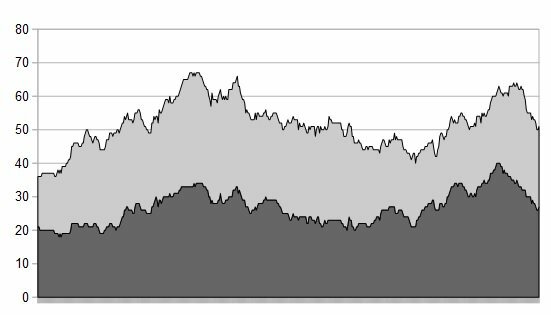 The key difference with the 2018 edition is that it will be in full colour, have a lot more charts and tables, will be in two columns, and will aim to have more of a lighter, mainstream feel to it. As such, I need a graphic artist to help me with that layout. Responsibilities will include designing a header, footer, and background for each page, designing all the tables, charts, and graphs from the data that I provide, and essentially being responsible for the overall look and feel of the Hockey Abstract 2018 Update -- it will be released the first week of August 2018. If I can successfully negotiate the usage of player photographs, then the responsibilities will include the selection and layout of those as well. As for compensation, there isn't a great deal of profit in these digital updates, but I place a high value on the work of others, and aim to share whatever money is made as generously as possible. We can agree on a set amount for your work, or a percentage of the profits, or a combination of the two. Putting together these updates is the best part of my entire year. It's a lot of fun, very rewarding, and people really appreciate the end result, and how it helps unleash their passion for hockey, analytics, and the coming season. If you're interested in joining me as the graphic artist for the Hockey Abstract 2018 Update, then I look forward to receiving your email at vollman at hockey abstract dot com by February 15. My recent article on ESPN Insider explored the idea of trading Auston Matthews, and tried to land on a situation where it might make sense. Despite the modest tone, even the mere suggestion that such a possibility should be examined had exactly the outraged response that any reasonable sportswriter would expect. Even at my beer league game that Friday, someone in the locker room asked me if I heard about the idiot who wrote that Matthews should be traded. Well, having taken a week for things to die down and for everyone to move on, I decided to devote today's blog post to this experience, and what I learned from it. The primary focus is on the subject matter itself, but I chose not to completely avoid the non-hockey aspect, and have a few thoughts on online sports debates in general. 1. How Many People Disagree? 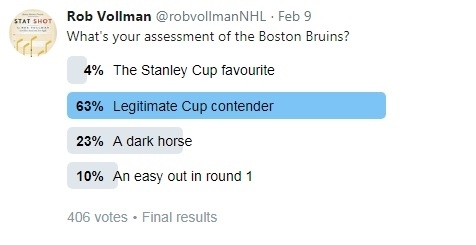 The great majority of people completely disagreed with the idea of trading Auston Matthews, but not necessarily because there was anything wrong with the argument itself. In most cases, they simply don't think Matthews shouldn't be traded, no matter what. He could ask for $16 million, lose a leg, and they'd still argue that the building should be burnt to the ground before Lou picks up a phone. Well not really, but you get the idea. 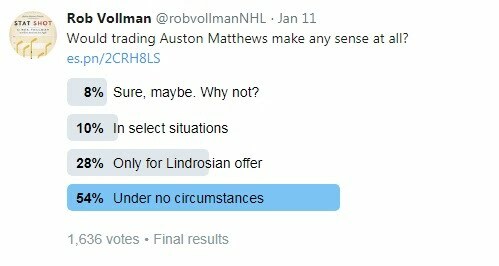 Based on a Twitter poll, only 18% of fans would consider trading Matthews for anything less than a Lindrosian offer (e.g. for McDavid himself, or some crazy haul). That means that no argument would ever persuade most people that this option should receive any consideration. 2. Is Matthews at McDavid's Level? There are two possible explanations for these results; either Matthews is viewed as the (second) most valuable player in the NHL, or there's a philosophical opinion that a team's top player should never be traded, no matter who it is. Personally, I think it's the former case. If I ran the same poll with McDavid instead of Matthews, I'd probably get the same response, or even lower than 18%. But, if I ran it with Nikita Kucherov, Johnny Gaudreau, Vladimir Tarasenko, Jack Eichel, or anybody like that, I probably wouldn't. I'm totally speculating here, but they'd probably all be safely above 20%, or even 30% and 40%, despite the fact that they each have far more reasonable cap hits. 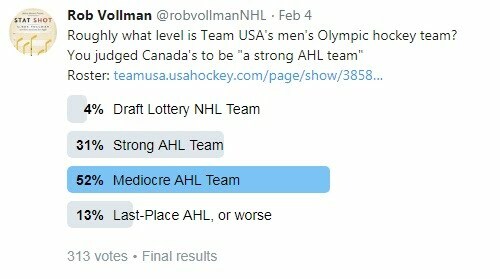 To test that theory, I ran another poll to see just how many players are classified as non-tradeable, like Matthews and presumably McDavid. If there were only a few, then that means people perceive McDavid and Matthews as sort of a 1A and 1B in the world. If that's the perception that people have, then I can definitely understand why they wouldn't want to trade him under any circumstances. In that case, I should have invested more than one paragraph demonstrating that there are few indications that's he's at that level. And, if some of the NHL front offices feel the same way about Matthews, then that means there's a huge possibility of getting a Lindrosian offer for him. On the other hand, if there are a lot of players who were felt to be non-tradeable, then it's more a philosophical discussion about trading away franchise players in general. However, the results seem to suggest that's not the reason for the first poll's results, and therefore Matthews must be perceived to be in very, very select company of five or fewer players. 3. Should You Ever Trade a Franchise Player? Despite those results, some of the objections I saw through social media, on message boards, and in the comments involved a philosophical opposition to the idea of trading franchise players at all. Many felt that Lindros was pretty much the only example of a case where that worked out. This is really a separate topic but, even if it's true, we need to know why it rarely works out. There are any number of reasons why trading franchise players hasn't worked out in the past (assuming that's the case), and some of them might not apply anymore, nor may they apply to this situation. Just knowing that something hasn't happened in the past (assuming it didn't) isn't enough -- we need to know why. This would be a great future study, no doubt. 4. 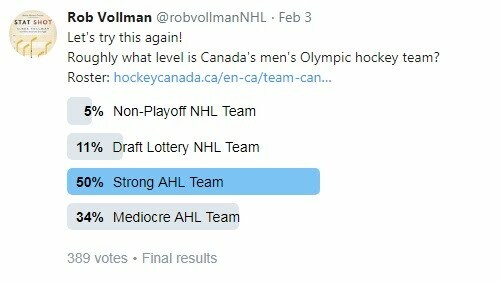 Are Centres More Important Than D-Men? Another great topic for future study is whether it makes sense to trade away a franchise centre, especially for a defenseman. To defend this theory, some fans pointed to recent Stanley Cup winners, and argued that almost all of them had a franchise centre. First of all, it's a matter of opinion just how many recent Stanley Cup winners truly had a franchise centre -- which means they must be among the NHL's top five at that position. Sidney Crosby certainly qualifies, but do Anze Kopitar, Patrice Bergeron, and Jonathan Toews? Perhaps -- but there's an argument either way. I chose top five arbitrarily, because by definition the majority of the 16 playoffs teams are likely to have someone in the top 10. Secondly, the pool of Stanley Cup winners is pretty small -- just four teams in the past eight years. If we expanded the list to include all Stanley Cup finalists, would we find the same pattern? Last year, two of the four finalists were strong down the middle (Pittsburgh and Anaheim) and two weren't (Nashville and Ottawa). That's still not enough data on which to judge, but if it was true that you MUST have a franchise centre to be a contender, then they should be overwhelmingly present among the finalists, and mostly absent from the early eliminations. While that's certainly another great study for another day, I can venture an opinion on that right now. In short, my position is that teams should maximize the value of their roster regardless of position. At times, one position or type of player is overvalued and hard to acquire, and at other times they're plentiful and affordable. You need to navigate these "market fluctuations" and assemble the best possible roster at any given time. For most teams and at most times, that won't always include a franchise centre. However, this is a matter of personal opinion, and I don't have any kind of formal study to back it up. 5. What Would be a Fair Return for Matthews? Sometimes, the counter-argument was there was just no way for any team to construct a fair offer for Matthews that was in any way realistic for the other team. Well, part of my theory was that some team would get swept up in the same hype and hysteria that we saw from the fan response to this article, and actually make an offer that was far too generous, and not in their own interest. Quite frankly, it's difficult to construct a win-win trade that involved Matthews -- but not impossible. Since I was mostly exploring the merit of the whole idea, I only pitched a couple of rough ideas that pointed in the right direction. However, Evan Presement took a closer look on Leafs Nation, if you want to explore this idea further. 6. Couldn't Toronto Get a D-Man Another Way? Absolutely. For Toronto, Plan A has to be to find that last missing piece of a strong, top-pair defenseman through free agency, or by trading away picks, prospects, or players other than the team's franchise player. Worst case scenario, Plan B would involve moving someone like Mitchell Marner or William Nylander instead. Just because trading Matthews isn't Plan A doesn't mean that it shouldn't be considered at all. Toronto needs to get on top of all of its options, right? If the veteran free agents and players like Marner and Nylander all sign very reasonable contracts, or if no other organizations seem to be offering much in exchange for any of them, then Toronto has to be ready to start moving down the list to Plan C and D --although trading Matthews is probably more like Plan K or Plan L.
There was at least one fan on social media that was particularly passionate about this point, and felt that it should have been the focal point of the article, instead of focusing on Matthews. In fact, he got very passionate. I love passion, because without passionate fans, there wouldn't be a demand for sportswriters. And, I always have the greatest respect for the opinions of others -- not that anybody needs that to have one! Usually, most fans settle down when you respond respectfully and cordially, back off the hyperbole, and engage in grounded discussion. However, with a topic like this, some fans get understandably swept up in their passion. In one particular case, because this fan would have gone in this different direction with the piece, he argued that my work was sad and insane, and that fans deserve better than a lazy troll writing irresponsible nonsense who doesn't show his work, has deliberate omissions and egregious oversights, dodges questions, and only cares about money and clicks. Surprisingly, he didn't classify any of that as either hyperbole, or a personal attack. However, I do think he captured the spirit of most fans. 7. Were There A Lot of Personal Attacks? Yes, but not nearly as many as I expected. We're getting off topic a little bit, but I didn't want to ignore these types of questions completely, because I do think things have become more civil than they used to be. Years ago, when I worked for Bleacher Report, it was perfectly normal to be subjected to a stream of vulgarities and profanities after even the most benign article, not to mention threats, questions about my sexuality, and detailed accounts of intimate encounters with my mother. I honestly had no idea my mother was so popular until I became a sportswriter. To my knowledge, none of that was the case this past week, so either my mother has settled down, or things have become more civil. Most of the people who argued with me were essentially paraphrasing my own closing words. That's why it isn't unreasonable to suspect that Blundell left off this closing argument on purpose. That being written, I'm also surprised that he would post (almost) the entire article on his website. I don't do that on my website, and I wrote the darn thing. All you'll find here is the opening paragraph and a link to ESPN Insider. After all, I don't own this work (and neither does Blundell) -- ESPN does. Even if I wanted to use my own work in another article or another book, I'd have to reference the original piece. Speaking of ESPN, I'm also surprised that so many of the personal attacks were aimed at them, instead of me. Or, at least, in addition to me! None of this really bothers me, because I believe in my work. I didn't just roll out of bed and write this article, it's based on the model introduced in the first chapter of Stat Shot. I believe in this model. It's the culmination of many of our field's major advances, it has worked well in countless other situations, and it's similar to models in use in NHL front offices. Some detractors told me I should be fired, or that I should quit and do something else, but the reality is quite the opposite. If I didn't believe in my work enough to write this article, THAT is the day I should quit (or get fired). Despite all the work that went into it, popular opinion was that this article qualified as clickbait. To be honest, I wasn't even sure what that even meant before this past week. I've never been accused of writing clickbait before. This is my 10th season at ESPN, and I have also written for several other sites, and this has never come up for either me, or the site's other writers. In fact, I even had to look up what clickbait even was. The most common definition for clickbait is "content whose main purpose is to attract attention and encourage visitors to click on a link to a particular web page." I guess the key phrase there is "main purpose", since every article seeks to attract attention and wants to encourage people to check it out. Further research adds some clarifying criteria to this definition, such as it has to be full of ads and designed to increase advertising revenue, and the content itself is usually of no merit whatsoever, and possibly even unrelated to the title. Since there are no ads on ESPN's website, since I don't get paid by the click, and since the article itself clearly involved a great deal of research (whether you agreed with it or not), it certainly doesn't appear to be clickbait. In fact, nobody who was familiar with me or my work, and very few people who actually read the article classified it as such. I was even honoured when Richard Deitsch tweeted that "I would not deal Auston Matthews. But this was a reported and intellectual look at such a potential deal. Appreciate seeing something smart when I expected a pure page views play." 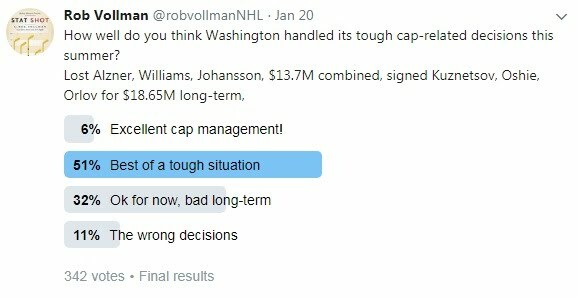 And, in a recent article for The Hockey Writers, Ben Brown wrote that "the article itself was thought-provoking, and there was a lot of statistical analysis to support the premise, but I’m still not buying what Vollman is selling, for various reasons." In my view, both Deitsch and Browne accurately summed up the prevailing opinion of those who really keep up to speed on hockey journalism -- that they appreciate the argument that was made, but they disagree. However, I can certainly understand how someone would think it was clickbait based solely on the title. If they were unfamiliar with me or my work, and didn't read the actual article, then they would have no way of knowing the difference between this article, and actual clickbait, based on the title alone. For that reason, it's hard to take any of this too personally. 9. Who Wrote the Title? I didn't choose the title ("The Case for Trading Auston Matthews"). In fact, I've never chosen a title. Titles are typically chosen by the site's editor, as are any accompanying photos. Sometimes, the title even changes after an article is published. Obviously, the writer can suggest title, and object to the editor's choices, but this is the standard practice everywhere that I have worked. 10. Who Chose the Topic? I did. On occasion, the editor assigns me a topic, but usually I pitch a variety of ideas, and they pick their favourite one, or a slight variation thereof. In this case, this was my only pitch. It was something I've been meaning to write for awhile, and now seemed like the right time to do it. Normally, the editor just gives me a red light or a green light, but this time I got a yellow light. He wanted to know more about my particular angle. Once I laid it out, he loved it, and I forged ahead. I also filed it earlier than usual because we wanted to make sure that the arguments were clear and well-defended, and that I struck the right, modest tone. Still, we weren't ignorant to the reality that it would cause a lot of controversy. If anything, that was a minus, not a plus. But, ESPN does pride itself on offering content that you can't get elsewhere, and you have to admit that they certainly achieve that goal this time. Thanks for reading.